(CBS/AP) WASHINGTON - The U.S. is carefully expanding efforts to provide intelligence, training and at times small numbers of forces to African nations, to help counter terrorist activities in the region, the top American military commander for Africa said this week. Speaking to a conference that included representatives from African nations, Gen. Carter Ham, head of U.S. Africa Command, says coordinated moves by several Africa-based terrorist groups to share their training, funding and bomb-making materials are worrisome and pose a threat to the U.S. and the region. Ham claimed Africa's three largest Islamist terrorist groups - Boko Haram in Nigeria; al Qaeda in the Islamic Magreb (AQIM), which is spread across the Sahara; and al Shabab in Somalia - have been sharing money and explosive materials while training fighters together, Reuters reports. While Boko Haram and al Shabab have a strong nationalist bent, Ham claims recent evidence of cooperation - especially between Boko Haram and AQIM - is particularly worrisome to American interests. He pointed to U.S. surveillance in central Africa to try to ferret out rebel leader Joseph Kony and his Lord's Resistance Army and said it is the type of thing the U.S. military can do, but only when invited in to partner with African nations. "Do we collect information across Africa? Yes, we do," said Ham, singling out the LRA. "To have some intelligence collection capability that has the ability to monitor the areas in which we believe the Lord's Resistance Army is operating, to be able to see, to be able to listen, to be able to collect information which we then pass to the four nations, four African nations, which are participating, I think is a good way ahead." Last October President Barack Obama sent 100 U.S. forces into central Africa to help regional militaries track Kony. On Libya, Ham said that the U.S. is seeking a partnership - not a large military presence - as the nation takes shaky steps to set up its own government after last year's violent ouster of longtime dictator Muammar Qaddafi. Saying that al Qaeda and other terror groups want to establish a foothold in Libya, Ham said the U.S. and Libyan officials have been meeting to "map out what the U.S. assistance might be for Libya well into the future." He said the U.S. is looking to provide assistance - "certainly not a large military presence, probably no permanent military presence" other than in the embassy mission. In cases such as the effort to track Kony or help Libya, Ham said the U.S. can provide intelligence sharing, logistics, communications and a bit of mobility support, which usually refers to aircraft transportation for either personnel or supplies. "Occasionally we do in fact have deployments, short term deployments of capabilities throughout the continent of Africa," said Ham, who is only the second commander of the relatively new Africa Command." 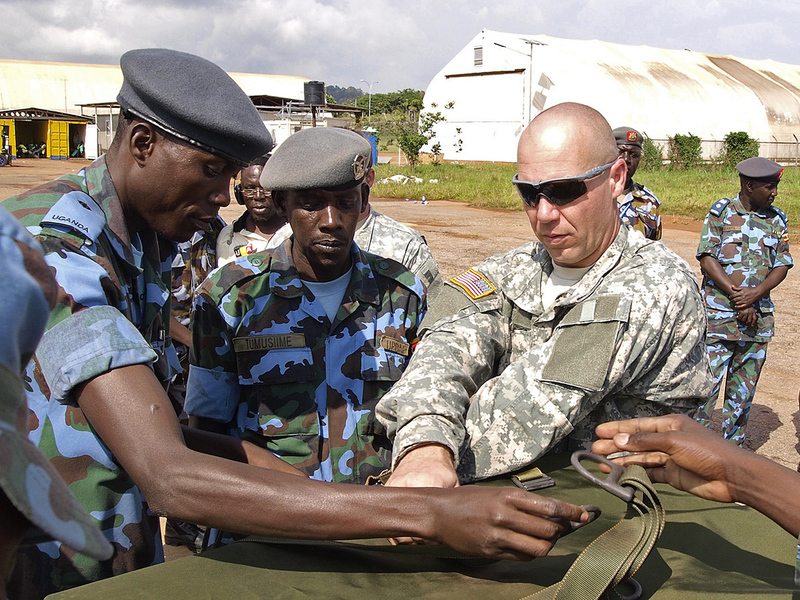 U.S. military activities in Africa have long been a sensitive subject among many nations that inhabit the sprawling continent and worry that the U.S. would try to establish bases or send forces there. Initial plans to set up a headquarters for Africa Command on the continent hit resistance and were shelved, and Ham said that is not likely to change in part due to the high cost of building such a facility. The U.S. Africa Command is currently based in Germany. Since then U.S. officials have worked hard to convince African leaders that the U.S. is here to assist the countries only in ways that they want. But in recent years, as the terror threat in Africa from al Qaeda affiliates has grown and taken hold, the U.S. has become far more active in providing training and funding, particularly in the northern and eastern parts of the continent. The U.S. has a military base in Djibouti, in the Horn of Africa, and there are about 2,000 U.S. troops there. He said there are only "small, temporary" troop presences in other nations, in places like Liberia, Morocco and Cameroon, including for training and military exercises. Altogether, Ham said, the U.S. has trained as many as 200,000 peacekeepers and enforcement personnel from about 25 different African nations. Ham also warned the conference audience that if African nations want U.S. support and make a request, they should be aware that the U.S. is a large bureaucracy with many complex regulations and policies, and "speed is not our strength."